Taste test: With our primary Australian chip reviewer unwilling to try meat-flavored chips, these were handed off to her meat-eating deputy, and the verdict wasn't so good. The chicken flavor was overly strong and extremely salty. 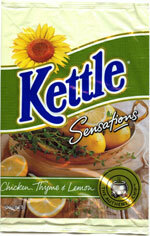 It was impossible to taste the thyme, and the lemon flavor clashed with the saltiness. All in all, not very good. He doesn't think he would ever eat them again.